With no. 11 needles cast on 60 stitches. Work in k 1, p 1 ribbing for 8 inches. Row 1:K 2 tog, k 10; repeat until end of the row. Row 3: K 2 tog, k 9;repeat until end of the two. Continue decreasing in this matter on each knit row, purling every other row. The last decrease row will be k 2 tog, k 2. Then cut yarn leaving a 20 inch length and with a tapestry needle, cut yarn and thread through remaining stitches and pull tightly. Weave in ends on wrong side of work and cut yarn. 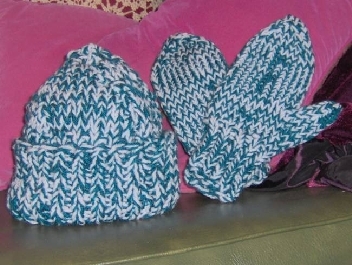 With size 10 double pointed needles cast on 20 stitches and divide on 3 needles.Work in k 1, p1 ribbing for three inches. Change to stockinette and increase 4 stitches evenly spaced on the first row. Row 3: K 11 stitches, place marker; increase 1 stitch in each of the next 2 stitches; place second marker, k 11. Row 5: Knit and increase in stitch just after first marker and stitch just before the second marker. Continue to increase on every other row until there are 10 stitches between markers. After this last increase, knit one row. Following row: k 12, place 8 stitches on holder, k 12. Palm: Continue to work in stockinette stitch until work measures 5 inches above cuff. To Shape end: Place markers dividing the stitches into two groups with 12 stitches in each group. K 1, ssk, knit to within 3 stitches of next marker, k 2 tog, k 1. Repeat this decrease once more. Continue to decrease every other row a total of 4 times until there are 8 stitches left (4 in each group) Cut yarn leaving a 12 inch length, pull through remaining stitches and weave end stitches together on wrong side of work. Thumb: Divide thumb stitches on three needles. Pick up and knit two stitches at the base of the thumb, placing one stitch at the beginning of the first needle and second stitch at the end of the third needle. Knit these eight stitches for three rows. Next Row: K 2 tog, k 4, k 2 tog. Work the next four rows even. Row 5: K 2 tog across row. Cut yarn and thread through remaining stitches and pull tightly. Weave in ends on wrong side of work and cut yarn.